This is one of the most peculiar or fascinating blackjack variants available. 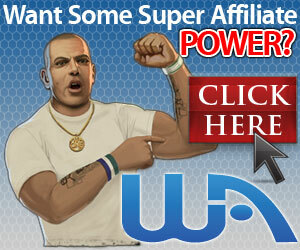 It is extremely popular in the Southeast Asia casinos. 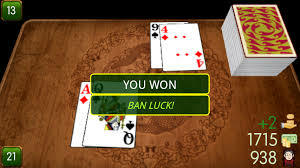 Chinese Blackjack is also known as Ban-Nag, Ban-Luk or 21-point. Outside of Southeast Asia, you will primarily find it online, not in land-based casinos. While there is no limit to the number of players allowed, it is usually played at a table with 5-6 players. All players are playing against a dealer. The goal is to get as close to 21 point as possible without going over, while beating the dealer’s hand total. It is played with only 2 decks of cards. Cards are valued exactly the same as in standard blackjack, except for aces. Face cards are valued at 10 and numbered cards are valued at their numeric value. The value of an ace depends on the number of cards the player has. 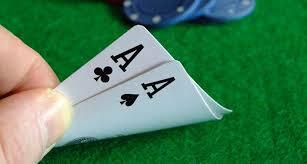 If a player has two cards, the ace can count as 10 or 11. If a player has three cards, the ace can count as 1 or 10, If a player has four or more cards, the ace will only count as 1. Each player is dealt two cards, face down, with the dealer being the last to receive cards. Here’s where the fun differences begin. While the players have the option of hitting or standing pat, there are certain hands in Chinese Blackjack that are immediate winners. A Ban-Ban – Having two aces. It is paid off at 3-1 immediately, unless the dealer also has a Ban-Ban, or an “escape hand” (discussed later). In the case of a tie like that, the player does not collect. 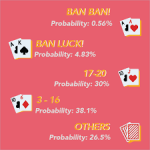 A Ban-Nag – Exactly the same as a standard blackjack, an Ace and a 10-value card. It is paid off at 2-1, unless the dealer has a Ban-Nag or Ban-Ban. An Escape Hand – A starting hand totaling 15. If a player is dealt a “15,” he may opt to continuing playing the hand or he may resign the hand and get his bet back. This also applies to the dealer. If the dealer is dealt a 15, he can opt to continue playing or resign the hand. If he opts to resign the hand, the hand is over and the cards are shuffled to start a new deal. A 5-Dragon – A player hand of 5 cards that totals 21 or less. If the total is less than 21, the pay off is 2-1. If the total is exactly 21, the pay off is 3-1. 7-7-7 – If a player is dealt two sevens and gets another one after hitting, the player is paid 21 times his original bet. If a player busts with 5 cards, the player has to pay double his wager. The more intriguing differences start here. The dealer is the last to act on his hand, once all players have made their decisions of play. If the dealer holds a powerful hand, the player can easily lose big. 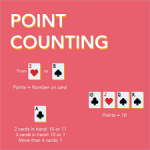 Except for a total of 15, the dealer must hit to improve his hand, if he has 16 or less. With 16-20, he may “reveal” a certain number of player hands before deciding whether to hit or stand. Basically the dealer can check if his hand already beats a player’s hand, before deciding to take one more hit. If the dealer gets 21 without busting, the hand is done and all players lose their original bets. If the dealer busts, all players are paid even money. If the dealer is lucky enough to get a 5-Dragon without totaling 21, all player lose must PAY the dealer TWICE their original bet. 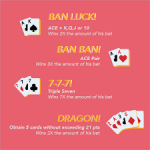 If the dealer hits a 5-Dragon that totals 21, all players lose and must PAY the dealer TRIPLE their original bet! Fortunately that doesn’t happen too often, or a player could go through their bankroll very quickly! It should be recognizable that the house holds a clear edge over the player with this game. Because of the possibility of having to pay the dealer triple your bet, this is truly a gambler’s game! Sure, there is skill involved in playing Chinese Blackjack because you can use some basic strategy, but the house edge is still quite significant. As you can imagine, with the unique and complex rules variations, Chinese Blackjack will challenge even the most experienced blackjack players, making it an increasingly popular online blackjack option. I believe what makes it intriguing and popular for experienced players is that there are several winning scenarios that payout at 2:1 or better. With standard blackjack, except for hitting a blackjack, your wins are paid out at even money. It’s another great choice if you’re bored with the standard blackjack game. This entry was posted in Blackjack Variants. Bookmark the permalink. Thank you for explaining in detail how to play Chinese Blackjack. To be honest this is the first time I am hearing about Chinese Blackjack and it sounds like a lot of fun to play. Yes, there are many different variations of blackjack available. They really are quite interesting and fun. I can’t do you justice here as I have never played standard blackjack. What an interesting concept though. The excitement for players would be definitely the risk of getting the big win! Do you play this? How do you find the game? Wish you every success with your site. I haven’t actually played this version yet, but I soon will. To play successfully it is a good idea to completely understand the rules, so now I feel comfortable enough to try the game. Thank you! Firstly, I didn’t even know this existed! It sounds so cool! I got into playing blackjack – and winning, a couple years ago. While I do not play all of the time I think I have enough of a basic understanding to start to branch out on the game. You really have clearly laid out the rules and I think after a couple dummy hands I could definitely get the hang of it. Maybe I’ll have to get a plane ticket down to SouthEast Asia to check it out! I don’t know about actually flying to Asia (LOL!) but definitely trying it online should be enjoyable! Good luck to you! That sounds like a lot of fun to play! My husband and I are fans of casinos, and he always plays the tables. He thought the game sounded like a challenge, one he would be glad to accept. Thanks for sharing! Yes, it’s certainly different and exciting to play. There are a lot of variations of blackjack to alleviate the boredom of standard blackjack. Good luck to you!